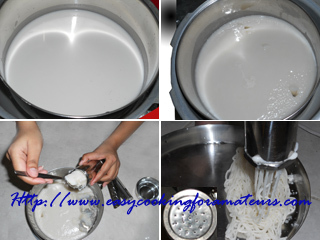 It is one of the traditional South Indian home made rice noodles which is called “shavige” in Kannada & Sevai in Tamil. Usually this is prepared using parboiled rice. It is served with chicken curry (chicken sambar) or coconut kheer (kai haalu). Shavige hollu/Sevai press/noodles press with small holes. Wash & soak rice in water overnight (let the water be 1 inch above the rice). Grind rice & coconut to a smooth paste with little water but it should be thick batter consistency like idli batter. Grease idli plates with oil & pour the batter into plates. Steam in pressure cooker for 10 minutes without using weight. Note: I used cooker pan instead of idli plate. Grease oil to a pan & pour 1 1/2 inch batter to a pan & steam it for 15-20 minutes without weight. Noodles should be pressed when it is hot, so take required dough & close the lid to keep the rest warm. Cold dough is very difficult to press. Wet the noodles press & spoon to avoid the dough sticking to it. Fill the dough to the noodles press. Press out the noodles into oval or round shape overlapping 4-6 layers of circle. Repeat the same with rest of the dough & make sure to leave gap between each noodles. Note: Don’t cover the noodles as soon as pressed it should be left open. 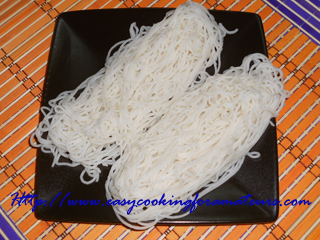 Rice noodles is ready to serve with chicken curry or coconut kheer (kai haalu). @Biny Anoop, Yes its the same. Idiyappam looks dleicious love them. Thanks for sharing with us this useful recipe of rice noodles. I would surely try preparing it this weekend. Just love with coconut milk and sugar, my fav. Ohhh used to eat this a lot when I was young! Thanks for your recipe! Now I can make it myself! Nice healthy one,Madhura! !I love this..
wow, perfect looking noodles Madhura! Love this! I love this steamed goodie. Looks delicious. Looks yummy and perfect ! !..